Burning solids such as paper,wood,fibers & Plastics etc. Burning Liquid such as oil,petrol, thinner,kerosene etc. Fire has been the most standard discovery made by human. However, it is likewise the most unsafe discovery, as a modest carelessness can prompt ruin and destruction. In instances of fire emergencies, fire extinguishers are utilized in avoiding and moderating losses caused by fire. We offer a range of Fire fighting equipments, fire safety equipments, fire protection systems, and fire extinguishers in Gujarat, Mumbai, and all over India. Veerfire is a brand in the industry that also provides various fire fighting chemicals and their equipments in entire India. 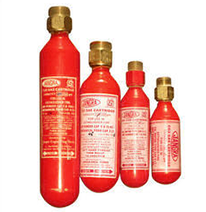 We are pioneer manufacturers of squeeze grip Co2 type extinguishers and squeeze grip gas cartridge type fire extinguishers in India. All of our product range is manufactured as per Indian / British standards and tested by professionals before sending in the market for sale. Our fire fighting equipments and fire protecting systems ensure safety and protection against fire. Veer Fire is a fire extinguisher recharge service provider that is a one-stop shop for all your fire extinguishing needs. We offer fire extinguishers refilling, maintenance, and inspection services at affordable prices. Our team comprises of experienced professionals who are knowledgeable about fire extinguishers and well versed with its types. Contact usand Ask for your Refilling Services now. Copyright © 2017, Veerfire, All Rights Reserved.